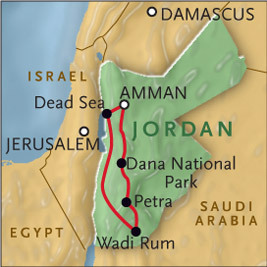 A pilgrimage to Jordan not only follows the footsteps of Jesus, but is a journey to the Promised Land in company with Prophets and Patriarchs from the Old Testament as well. Here we have a chance to explore the ancient world too, and visit Petra, a city carved from rock, as well as Lawrence of Arabia’s desert land. It is a journey not to be missed! who is Parish Priest of Saint Francis of Assisi, Friar Park, and an experienced tour leader to the Holy Land, Rome, Assisi, and Lourdes. All you need to do is contact him for a brochure and application form by using the contact details at the top of this page. 2 hour 4x4 excursion in Wadi Rum. DOES NOT include insurance (you can take the travel firm's if you wish) or travel to London (however, transport from Wednesbury/Kingstanding will be arranged).